The parking spaces at issue are on the east side of Calapooia Street between First and Second. The post office building is behind the cars; the Albany Carousel in the background. Downtown parking near the Albany Post Office and the new Albany Carousel will remain an issue for a while. That was clear from the city council’s discussion of the topic Wednesday night. At the suggestion of Councilwoman Bessie Johnson and others, the council put off action on a resolution to label 19 new spaces on the east side of Calapooia Street between First and Second Avenue as “3-hour customer only” parking. The change was requested by the Downtown Association, which manages and enforces parking in the core area. The request was prompted by the new carousel, which would like parking for its volunteers, up to 24 of them per day, in three shifts. Debbie Myers, president of the union local representing Albany letter carriers, pushed back, not just on the parking issue but the mayor’s notion that the post office should move. It’s a federal building and it’s not going to move, according to her. She also said postal workers bear the brunt of daily complaints about the new angled back-in parking. The 19 spaces on Calapooia, along with about the same number again on First and Second, were built by the city as part of its downtown streetscape project. All are angled parking spots — back-in only on Calapooia and Second — that more than doubled the number of parallel spaces previously available on the streets around the post office. The Calapooia Street spaces have for years been used by downtown workers including postal workers. Restricting them to three hours and customers only would force the postal employees who use them to park elsewhere. Myers told the council that letter carriers walk five to eight miles a day. 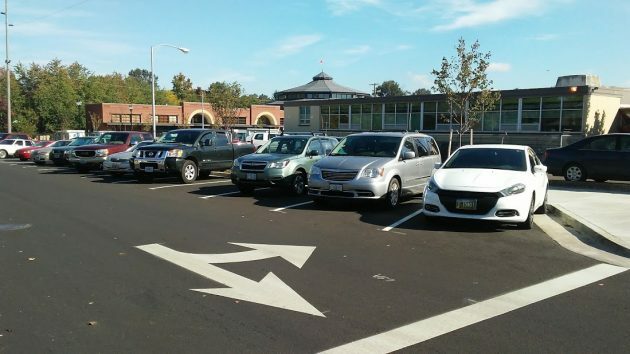 Why would the city make a change that would force them to walk farther to their cars at the end of their day in order to make things more convenient for carousel volunteers? “I just don’t understand,” she said. Whatever the impact of the carousel on parking or other issues, it’s likely to get bigger. Gary Goby, the retired physician who has been a leading force in putting the carousel together, told the council this: During its first 32 days of being open, the carousel had more than 44,000 visitors. Of the 2,519 who signed the guest book, 72 percent were from Albany or the mid-valley; 9 percent from elsewhere in Oregon, 16 percent from other states, and 2 percent (48 people) from other countries. All this without any ad campaign or website promotions and only a minimal effort in social media. But in December, the carousel will promote itself with a billboard on I-5. As for the parking resolution, Mayor Sharon Konopa said it will come back to the council, probably at the next work session on Oct. 9, and then at the next regular meeting on Oct. 11. This is quite an intriguing front – pitting senior citizens against Postal Service employees. Normally, Councilwoman Johnson’s “kick-the-can” style of governance is maddening. However, in this case, Madam Councilor is onto something. This is a loser whichever way the dice land. USPS employees forced to walk an extra block or so after their grueling shift fending off brutish mutts while delivering what has largely become junk mail versus unpaid Senior Citizens, living off the fat of the land on Social Security, salving their consciences by “volunteering” at the Carousel. Great headlines whichever way this story breaks. Good work, Hasso! I would have enjoyed listening to this session. Do you know if it is online somewhere to be viewed? Good for Ms. Myers speaking up for the Post Office and its workers. Again, while I support the Carousel, the ham-handed way the city has treated the Post Office this past year is very troubling. It’s not the fault of the Carousel, but the city council. How in the heck could the city decide to change the parking so drastically without discussing this and getting buy-in from the Post Office, which is the business most immediately impacted? How could they suggest the Post Office move without discussing this with the Post Office first, yet they have done so. It’s very shabby treatment, and they must stop. If you suffer from insomnia, this is the cure. As I stated last night, there is no proposal to the Council or from the Council to do ANYTHING with the Post Office, that is being pushed by the Mayor and portions of her special Committee. If there is a proposal that makes it’s way to the Council there will be push back by at least 3 councilors. why??? 2. on a piece of land that we already own, either next to 2 rivers market or between the bridges off of Water st.
3. That way, many of the visitors to the Carousel will have to walk past a whole bunch of downtown business. Right next to the Carousel is the LAST place to put it. Thanks for the reply Rich. I am recalling articles I have read here and in the Herald (I believe), and as you point out, it was usually the mayor pushing for the move. I may have conflated the mayor’s views with that of the council. “We’re loosey-goosey at this point,” said Olsen. Loosey-goosey. Ha. Willy-Nilly? Or just painfully slow to act. Regardless.. maga, Maga, MAGA!!!! Make ALBANY Great Again! Just because you volunteer for something doesn’t mean you have free parking. Perhaps a mass march of concerned citizens to surround the Post Office, chanting anti-USPS slogans while threatening the building with the same Tiki Torches the Pro-Nazi sympathizes in Charlottesville recently. In my opinion the post office brings many more people into downtown Albany on a daily basis than the carousel will. Any talk about moving it would be a mistake. Yes, the carousel drew crowds initislly but I don’t believe that will continue. The novelty for local people will wear off, if it hasn’t already, and there will be more folks patronizing the post office than will drive from I5 to ride the carousel. I’d like to see updated statistics for carousel attendance and revenue on a monthly basis.